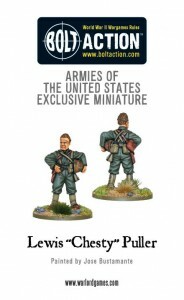 Warlord Games is taking names of who wants their Americans armies book for Bolt Action as soon as it's made available. Be the first gamer on your block with it when it's released, as well as a promo figure for it. The massed forces of Uncle Sam are ready to enter the war be it in the steamy jungles of the Far East, the arid North African desert or the greener but no less deadly environs of mainland Europe! You can now place a pre-order for this, the next Bolt Action supplement!